Climbing in beautiful and tranquil Burrington Combe in Somerset. The Combe cuts a swathe through the peaceful Mendip Hills - but some of the routes here are anything but tranquil! 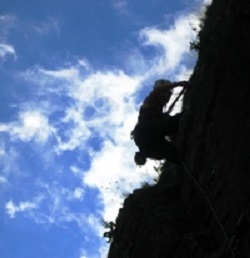 This crag offers some perfect beginners and children's climbing - on easily accessible rock. This is a modular session - which means you can pick a session from 2 hours up to the full weekend. Pricing is shown below - and is according to the length. This session will see you exploring the range of faces on offer at the Combe. There are many crags here and a range of climbing possibilities - as well as some other interesting locations close by. We shall be rotating climbing - as none of us will be able to climb solidly all day - and you will need to belay for a climbing partner during the day. There will also be time for lunch, and time for a tea break here and there - in one of Cheddar Gorge's well known coffee hang outs! Saturday - Meet at 09:00 (or according to your timeslot) in Burrington Village, assemble, initial briefing and get out onto crags. Start with some warm up exercises - and briefings on putting on harness, helmet, tying in and general safety information. Then progress on to climbing easy routes, and hopefully progress as day proceeds. All routes will be set with either top ropes or bottom ropes, in accordance with Mountain Leader Training Best Practice - to ensure maximum safety. Your leader will discuss mechanics of climbing with you during the session. This session is completely modular - and is designed to accommodate up to 6 persons at a time. You may book in for any length of session from 2 hours to the whole weekend. The instructor will move locations during the day - meaning that you get to try different routes if you are spending the whole day at the crag. This session is ideally suited to the beginner, and to the younger climbers - just making a start on real rock! Bunkhouse Syle Accommodation is available within a short Distance of the Combe itself. Also close at hand will be shops for buying snacks and lunch. What is a Level 2.0 Climbing Challenge Like? How Fit Do I need to be to join a Level 2.0 ‘Climbing Challenge’? This session covers solely the climbing itself, not accommodation or transport - although it may be possible to collect from the nearest train station if you ask us early enough! By nature all activities contain an element of risk.Your leader will be first aid qualified and will carry the appropriate safety kit for the activity, such as mountain safety shelters, walking rope and from time to time mobile radios. Safety equipment carried will be appropriate to trip. The leader's primary role is to ensure your safety, but it is your responsibility to listen to their guidance and instructions. 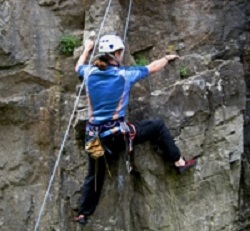 Please note - this activity is Risk Assessed, and is run by Qualified Rock Climbing Instructors - accredited by the British Mountaineering Council. All insurances, qualifications and Risk Assessments are freely available for inspection. Expect all kinds of weather - but we hope for dry weather - and will attempt to find suitable climbing whatever the conditions. In case of poor weather we will either re-arrange, or move to an indoor climbing venue - so check with us on the weather the evening before the event for final confirmation.